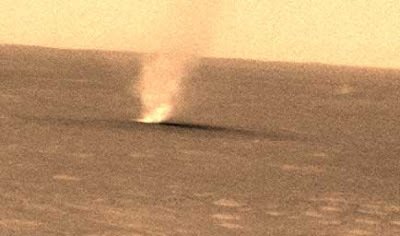 Ever wonder what a dust devil (small tornado) on Mars looks like. Wonder no more. Here are a handful caught on a sequence of images by the roving robot explorer Spirit, the sister of Opportunity, another robot on Mars. Click on the black and white image to view the video. This wind phenomenon is believed to cause warming of Mars as it exposes dark soil underneath the lighter sand. Being on Mars is like going up to an altitude of 100,000 feet here on Earth, where the air is thin and cold. The colored picture above was also taken by Spirit on the 486th day of the Martian year (Sol 486). Click here for a video on the latest images of the Martian surface from the robots.